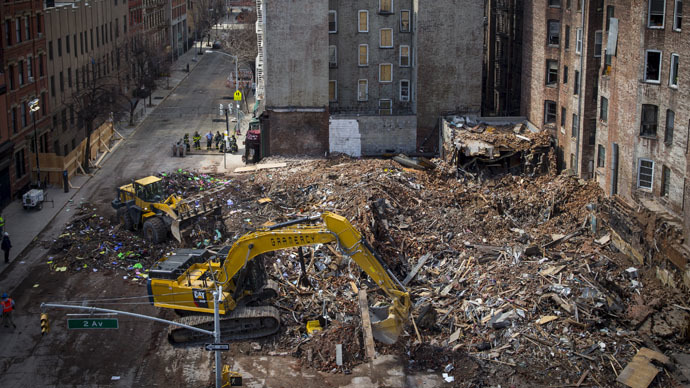 New York City officials have indicated that the cause of last week’s blast in the East Village neighborhood of Manhattan was caused by an improperly accessed natural gas line, calling into question the frequency of such configurations. The explosion at 121 Second Avenue killed two, injured around two dozen, and caused three adjacent buildings to collapse. One of the two killed was identified on Monday as Nicholas Figueroa, 23, who was eating in the first floor sushi restaurant at 121 Second Ave. when the explosion occurred. According to the Associated Press, DNA testing will be done on the second body found amid the rubble. Restaurant worker Moises Locon is still reported missing. The investigation of what happened at 121 Second Ave. is ongoing, but top officials said they are watching closely for an illegal gas connection. "There's reason to believe so far that there may have been inappropriate tampering with the gas lines within the building, but until we get full evidence, we can't conclude that," New York Mayor Bill de Blasio said Sunday. New York utility Consolidated Edison told the AP that improper gas hookups are “fairly uncommon,” but others in the business maintain that it’s a more frequent occurrence. "It's a regular, regular problem," said expert Mark McDonald, of NatGas Consulting. "Just as you can imagine theft in a Wal-Mart, no different — but it's much more dangerous." McDonald said has a gas worker around Boston for 25 years, he or a colleague found an improper set-up – some sophisticated and some quite crude – around once a week. "I've seen everything from complete morons to really detailed theft," he said. Federal statistics indicate that since 2010, 11 gas pipeline accidents based on illegal gas access have occurred nationwide. The AP reported that those incidents likely include only major episodes and not more minor or clandestine mishaps. In August, utility workers for Consolidated Edison found the restaurant to have an illegally configured gas hookup, according to AP. The utility shut down the building’s gas service for around 10 days while the building's owner had repairs done. Service was restored once the line was found to be safe, said Con Ed. Con Ed workers had been at the building just an hour before the blast. They deemed work to upgrade gas service did not pass inspection, locking the line as they left. Work was planned to install a bigger gas line to service the entire building, according to Con Ed President Craig Ivey. Shortly after Con Ed workers left, the restaurant owner smelled gas and called the building owner and contractor, according to New York Police Department Chief of Detectives Robert Boyce. The contractor and owner’s son went into the basement and opened a door, AP reported, only to be burned by the explosion. Fire investigators are in the process of clearing debris in order to reach the cellar, where the blast occurred. "When we reach the level of the gas piping, the way the debris is removed will change so that those who will investigate the mechanics of what happened will have access to that without it being torn apart," New York Fire Commissioner Daniel Nigro said. The building’s landlord has not answered repeated attempts for comment, AP reported. The building’s contractor has refused to comment on the investigation.